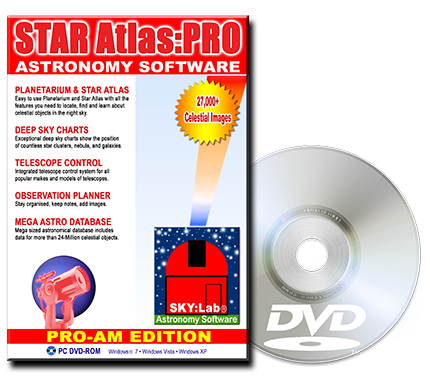 Easily create, display and export Lists of Astronomical Objects that fit your search criteria. 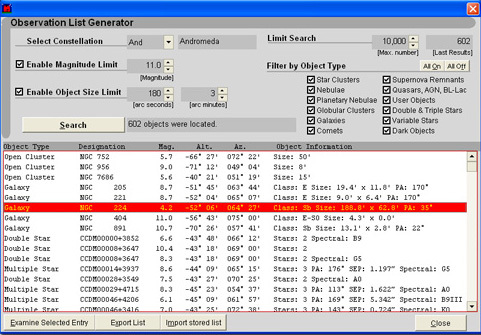 The powerful Observation List Generator provides you with a tool for easily creating and exporting Lists of Astronomical Objects. Easily perform searches like "find all Planetary Nebula brighter than Magnitude 12 whose size is at least 10 arc-seconds and located in the Constellation Scorpius". Searches that you create may be based on Constellation, Object Type, Magnitude and/or Size. Each entry in a list may then be charted, examined, you can even slew your telescope straight to each object's location. Each list may be exported to other applications like Microsoft's Excel.